The Alaska Board of Fisheries decided to once again to sit on the sidelines on the issue of controlling hatchery expansion of pink salmon production in Prince William Sound at its October workshop in Anchorage. A very hot topic in fisheries, multiple media reports focused on the hatchery issue, including the Alaska Journal of Commerce, KBBI public radio, the Mat-Su Frontiersman here and here, Medrednews.com here, Alaska Outdoor Digest, and nation coverage at Trade Only Today. Photo AJOC, Elwood Brehmer. 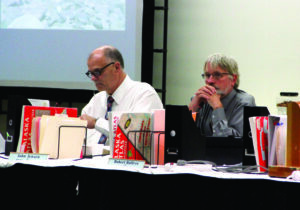 Alaska Board of Fisheries members John Jensen, left, and Robert Ruffner are seen listening to a presentation about the state’s hatchery programs on Oct. 16 during their annual work session in Anchorage. ADFG gave a 4-hour oral presentation on the topic of hatchery salmon to the BOF. The focus was on research and related issues, in particular the potential negative impacts of hatchery straying on wild salmon stocks and impacts of increased food competition between hatchery and wild salmon in the marine environment. The Department attempted to provide a better understanding of whether or not the record high abundances of hatchery pink salmon in the Gulf of Alaska are negatively impacting wild salmon stocks. The answer was that the ocean ecosystem is complex, and the Department does not have adequate tools or funding to answer that question. Both the BOF and the Department discussed the precautionary principle of do no harm to wild salmon stocks when there is little or no data known about impacts on a fishery resource. Nonetheless, the policy to proceed with caution in expanding fisheries that might have a detrimental impact on wild salmon was set aside, and no action was taken to cap hatchery pink salmon production at current levels. 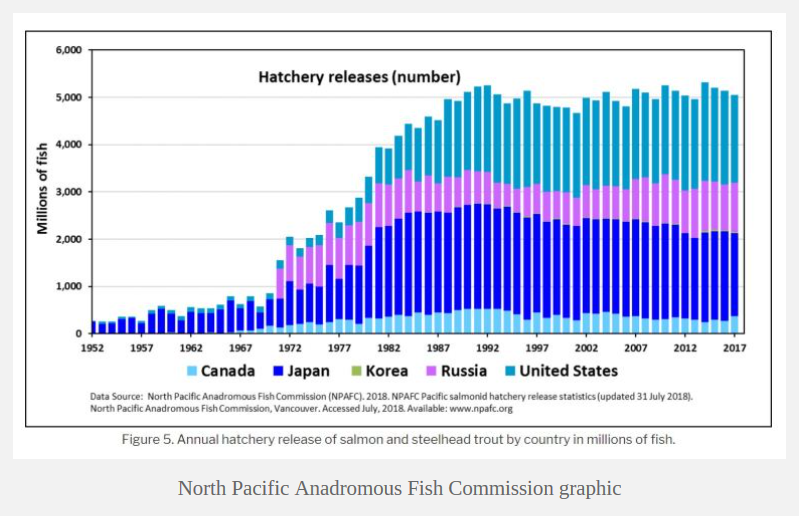 The United State, powered by Alaska hatcheries, leads the way in hatchery production of salmon in the North Pacific Ocean. About 85 percent of the overall hatchery production in the United State comes from Alaska. 99 percent of hatchery salmon are used in Alaska’s commercial fisheries. Recreational fishing is the nation’s second most popular outdoor activity after jogging. Nearly 1 in 7 Americans take to the water with rod and reel in hand each year. Spending for freshwater fishing is $41.9 billion. Spending for saltwater fishing ($14 billion) is more than twice what ($5.8 billion) Americans spent on services for their pets. If sportfishing was its own corporation, it would rank #54 on the Fortune 500 List, ahead of Cisco Systems.